Monument Valley is a game about paths that don’t exist – unless you want to see them. In its beautiful intricacy of platforms and perspectives that defy the laws of physics, geometry, and gravity, Monument Valley, developed by London-based studio ustwo, impresses visually and technically thanks to a fantastic combination of gorgeous artwork, intuitive controls, and just the right amount of puzzle-solving that works perfectly for an iPhone or iPad. In Monument Valley, you control Ida, a silent princess that has embarked on a quest for forgiveness that will require her to find exits in monuments once built by men but now inhabited by crow people, totems, and other strange entities. 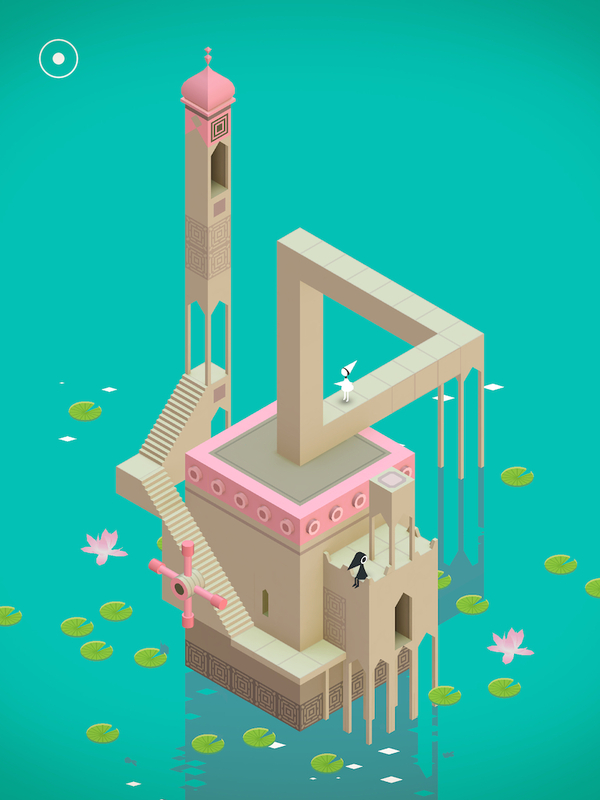 “Tap the path to move Ida”, Monument Valley begins, and, sure enough, tapping on the screen advances the character on a linear path, accompanied by a sound effect. The first stage of Monument Valley is immediately perplexing: while Ida can walk a few steps, the aforementioned path isn’t connected to anything. Hold and rotate a wheel next to the path, however, and a pillar changes its orientation, creating an optical illusion that allows Ida to walk over the path and reach the exit of the stage. Monument Valley perpetuates a lie – that perspective can be used to alter physics – for the sake of gameplay, and, ultimately, that’s fun and intriguing. Inspired by M.C. Escher’s drawings, impossible objects, and certain gameplay elements of Fez, The Room, but most notably Echochrome, Monument Valley presents seemingly impossible structures with staircases, doors, platforms, and other architectural elements that are either disconnected from each other or not visible. With taps and swipes, you need to move or rotate specific parts of the game’s structures (usually towers floating in mid-air, but also walls, rooms, and cubes) to change perspective and create illusions that allow Ida (or the crow people that walk across the stages) to follow a path to reach the exit, press buttons, or walk into doors. The end goal of each Monument Valley chapter may not be terribly original, but how it's done makes the difference. The use of perspective as a gameplay mechanic makes everything more interesting and, thanks to the lack of a high score system, calm and elegant. In Monument Valley, you won’t be asked to rush through levels to collect coins or kill enemies – rather, the focus is on an attentive examination of the structures and the laws of physics that you'll need to subvert to move forward. Monument Valley’s isometric view and Penrose-inspired constructions trick you into trying to decipher heights and paths through the standard concepts of “above” and “below” relative to your position and point of view. But because the game is built on the idea that physics is governed by perspective and touch manipulation, you have to think like the game and accept the nature of impossible constructions, which can require some time to get used to if you’ve never played with puzzle games based on this concept before. I don't want to spoil the game's chapters with screenshots -- Monument Valley's touch controls are simple and natural, and I got stuck on structures that "didn't make sense" on multiple occasions, and it was a pleasant experience. Thinking about the best way to create optical illusions in Monument Valley is fun -- especially when a haunting soundscape accompanies every touch and swipe in your interactions with Ida. The game's chapters are presented as structures that occupy the entire screen of an iPhone and iPad and that move, rotate, and unfold as perspective is changed. In interviews leading up to today’s launch, ustwo noted that, in designing Monument Valley (a process that spanned 10 months), they aimed at making every single screen a piece of art that could be hung on a wall. And there’s no denying that the goal has been accomplished: from a visual standpoint, Monument Valley is stunning and crafted with care. Structures elevate upon solid backgrounds or natural environments, taking you deep into dark rooms or floating across the sea as Ida attempts to find her way to the exit. The game’s color palette – vibrant but also capable of pulling off darker hues and desaturated tones with panache – makes simple details pop while a basic lightning system puts the game’s 3D graphics in perspective (no pun intended). Monument Valley isn’t the next Infinity Blade or Asphalt 8 in terms of 3D prowess, but it exhudes sophistication and elegance – traits that don’t require millions of polygons to be appreciated. On the Retina display, Monument Valley is indeed a work of art. Monument Valley doesn’t last long – the game can be completed in an afternoon – and the lack of high scores or additional challenges/modes diminishes replay value. I found myself playing some stages over and over just to appreciate the graphics and overall calmness of the gameplay; however, I also wished I could have more from the game and keep exploring those crazy structures with Ida and trying to understand what the storyline was all about. ustwo wanted to make a game everyone can finish, and this is definitely the case with the first version of Monument Valley: even if you’re not used to puzzle games, once you get how Monument Valley works, you’ll run through the game in a few hours. That’s not necessarily a bad thing considering the large audience of the App Store that probably doesn’t want or need 10+ hours of gameplay, but I hope ustwo will iterate and add more content in the following months. If you’re familiar with Echochrome, you’ll find similarities between Japan Studio’s puzzle game and Monument Valley, and you’ll likely think that ustwo’s impossible object mechanics aren’t as advanced or complex as the original PSP title. I believe that such a comparison would be unfair, though, as Monument Valley subtly implements concepts like perspective absence and existence without needing a tutorial, enriching the entire experience with color and graphics that, besides being gorgeous, bring context to lines and platforms. It’s a similar idea, but with a deeply different implementation and general vision. Monument Valley may not last for weeks or force you to think over individual stages for several consecutive hours, but every chapter is enjoyable and delightfully realized. 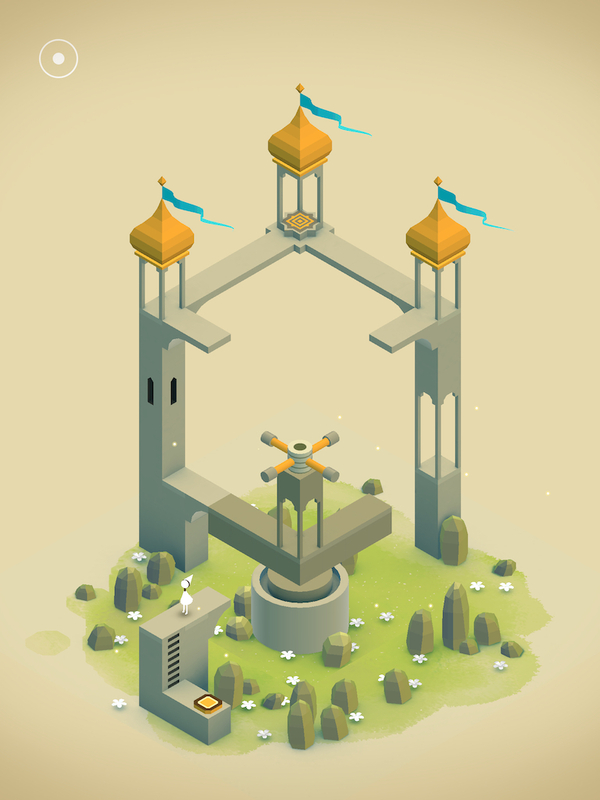 Monument Valley is an elegant and fun iOS game that offers a beautiful experience with no equal on iOS. Monument Valley is available at $3.99 on the App Store.